Picture your goals for 2017! Happy New Year!! I hope you have had a great start to the year. I thought I would start the new year, the year of Awesomeness, with an opportunity for you to “Picture your goals” for 2017, with ME!! I’m often asked many questions about how I do my sketchnoting and graphic recording with the usual comment being”…I love what you do but I can’t draw”. I believe if you can draw a line, then you can draw! Sketchnoting is a form of visual storytelling and it is more about drawing out your ideas than creating a piece of art and I would like to show you how! 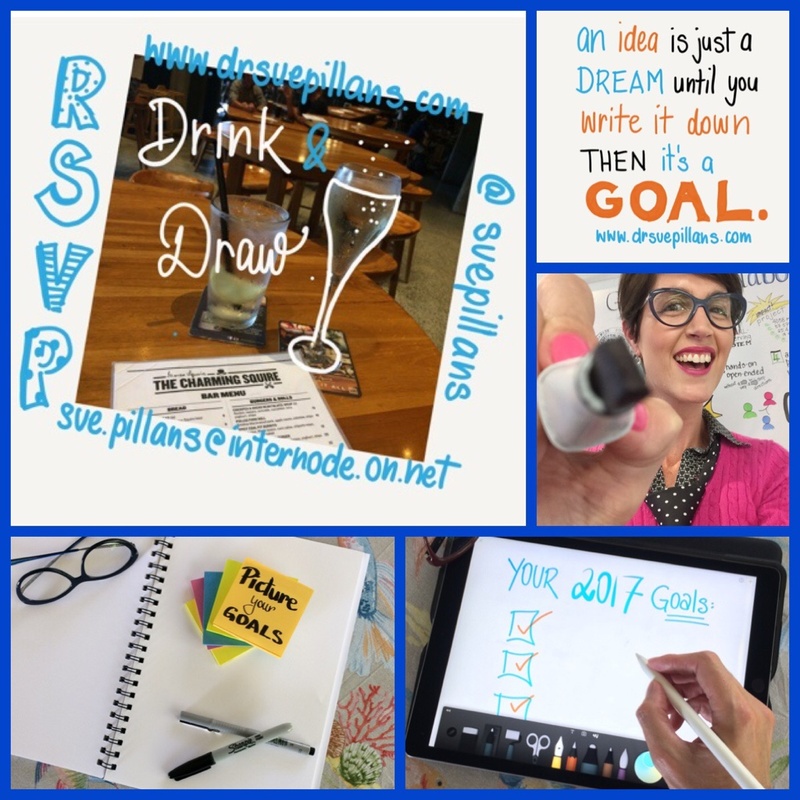 One of my 2017 goals is to be a part of more creative collaborations so I’m holding my first Drink & Draw MeetUp to help “Picture your goals” on the 24th January 2017 from 5:30pm in South Brisbane (details below). This will be an informal social MeetUp for anyone who is interested in “picturing their ideas” and meeting other people who want to use creative ways to communicate their stories. So RSVP as soon as you can so you don’t miss out and I look forward to helping you draw out your goals for 2017! What to bring: pen, markers, paper (or iPad*) and your 2017 goals! You can see more of my visual storytelling through my Graphic Recording and follow my creative journey via my alter ego Dr Suzie Starfish on Facebook (https://www.facebook.com/drsuziestarfish/) and @suepillans on Twitter and Instagram. ← My 2016 in Pictures!